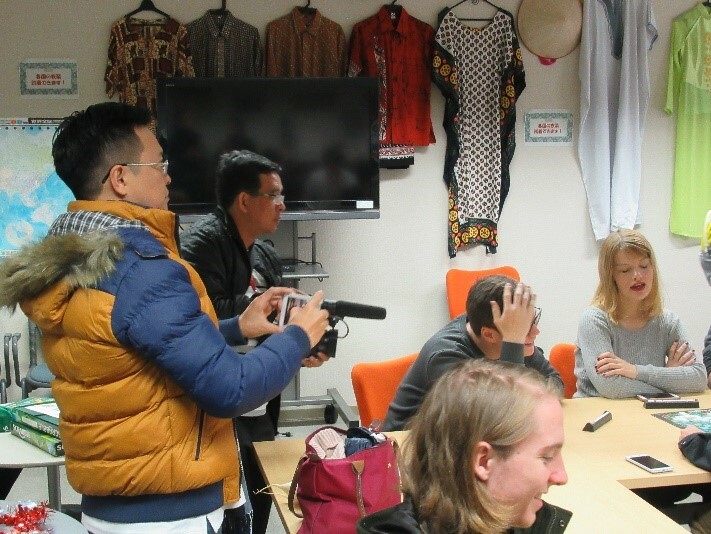 OSIP offers various events for international students and faculty members such as Japanese Class, cultural exchange activities with local communities. We will keep updating information for up-coming events. We had great visitors from Vietnam on Nov. 22, 2018. They are consisted of 13 different media (20 people) such as TV stations, magazine companies, web media companies, singer and actors etc. They visited the Computer Exercise room, Geek Dojo, and Global Lounge during the campus tour. 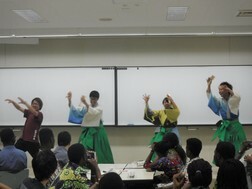 At Global Lounge, they saw the Japanese students were having an activity together with the International students. Then they had a Vietnamese lunch with the students including Vietnamese students at the cafeteria. At each table, they communicated each other by talking about their occupations, culture and various things. The students who participated the lunch had valuable experiences through having communication with Vietnamese people. The 21st International Talk was held by Center for Globalization and SAISUA at the Global Lounge, 1F Research Quadrangles on Friday, November 17, 2017. 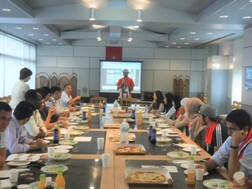 32 people including Japanese and international students, faculty and administrative staff members joined this event. 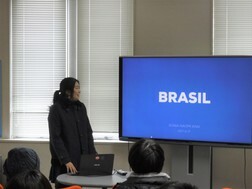 Ms. Sonia Naomi Arai (research student, from Brazil) was invited as a speaker. She introduced a wide variety of Brazilian culture such as 5 regions, food, nature, tourist spots and carnival. Mr. Kyosuke Mori, 3rd year undergraduate student and Mr. Atomu Sato, 1st year undergraduate student took the role of the MC. Some videos of carnival and soccer were also introduced in the event. The participants enjoyed the attractiveness of Brazil and international understanding as well. 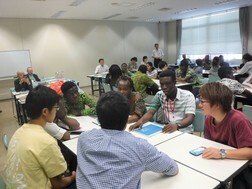 21 High School students from Ghana visited our university on Friday, September 1, 2017 to have an international activity with Japanese and international students. Mr. Kyosuke Mori, 3rd year undergraduate student took the role of the MC. And Mr. Pham Van Thanh from Vietnam,1st year doctoral student gave a presentation about his experience in Japan and introduced tourist spot and cuisine of Aizu. Continuously, the participants talked about their major, study abroad experience and their dream for the future. At the end of the event, there was a performance by UoA Yosakoi Dance Team. 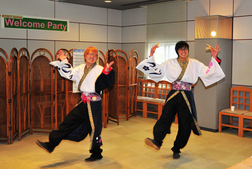 The participants enjoyed Japanese traditional dance. It was a great time to deepen international understanding. The 20th International Talk was held by Center for Globalization and SAISUA at the Global Lounge, 1F Research Quadrangles on Tuesday, August 1, 2017. About 37 people including Japanese and international students, faculty and administrative staff members joined this event. 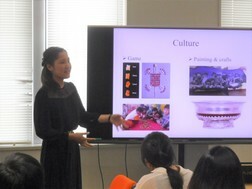 Ms. Onon Bayasgalan, 1st year master student (from Mongolia) was invited as a speaker. She introduced a broad variety of Mongolian culture such as history, nature, food, lifestyle and tradition. After her talk, there were a lot of questions from participants, and they had an enjoyable time for international understanding. Students from UAE visited the University of Aizu on July 27, 2017 as a part of Training Leadership Voyage for Youth Leaders in 2017. 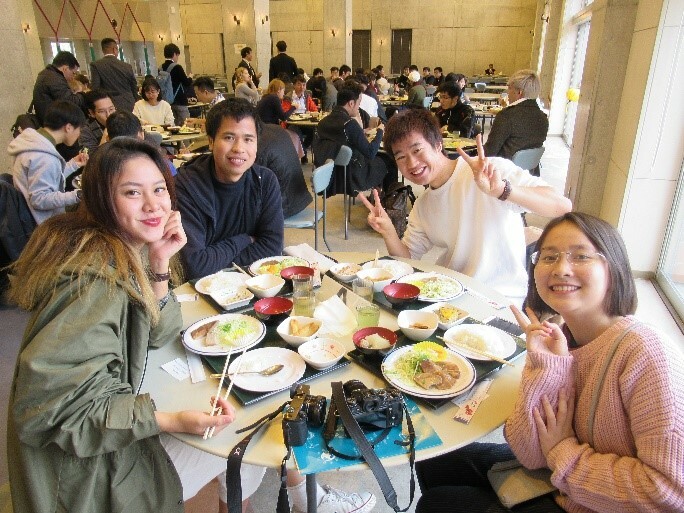 They had a lunch meeting with Japanese and international students of UoA to deepen international understanding. 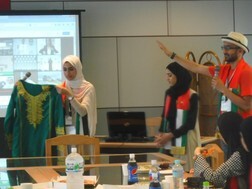 At the beginning of the event, UAE students introduced a national flag and gave presentations about their research. UoA students also introduced themselves, and all participants had a meaningful time to develop relationship beyond social, cultural and customary differences. Welcome Party" for new faculty and staff members and international/Japanese students was held at Keyaki restaurant (2F the Student Hall) on Thursday, May 25th, 2017. In this spring, new international students from China, Mongolia, Brazil, France and the US enrolled in our university. The event is jointly organized by Center for Globalization and SAISUA in spring and fall every year. There was a total of 77 participants including President Oka, Vice President Tei. President Oka and President of the SAISUA Villegas gave a welcome message, and new comers introduced themselves. Mr. Yoshinori Fujii, 3rd year undergraduate student and Mr. Absalom Shu, 2nd year master student from Cameroon took the role of the MC. The participants mingled and enjoyed the performance by UoA Wind Ensemble and Yosakoi Dance Team. Vice President Tei led the people to do "Ipponjime" which is a traditional clapping ritual to honor the close of a formal event. 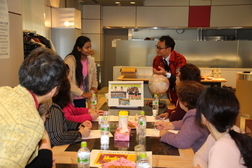 The participants learned Japanese language through self introduction in the first lesson. Our OSIP office will plan to provide 30 lessons on Tuesdays and Fridays for this Japanese Seminar. They will improve communication skills in Japanese and learn necessary Japanese language and culture to live in Japan. Ms. Hiruni Madhusha Rupasingha from Sri Lanka, Mr. Mohammed Hassan from Nigeria, Mr. Abdar Moloud from Iran, Ms. Nguyen Hoang Anh, Mr. Truong Quang Tung, Mr. Pham Ngoc Lam, Mr. Mai Hoang Duc and Mr. Nguyen Van Duc from Vietnam introduced their countries, and also served their some drinks and sweets. Every group enjoyed talking and trying to learn greeting in foreign languages. It was a great time to deepen international understanding. Office for Strategy of International Programs will keep providing such activities in the future.
" Welcome Party" for new faculty and staff members and international students who joined the University in October 2016 was held at Keyaki restaurant (2F the Student Hall) on Wednesday, October 26th, 2016. The event is jointly organized by Center for Globalization and SAISUA in spring and fall every year. There was a total of 72 participants including President Oka, Vice President Tei, faculty and staff members, and international/Japanese students. We were given welcome address by University President Oka and welcome speech by SAISUA President Villegas. Continuously new comers introduced themselves. New international students are from China, Taiwan, Vietnam and Iran. Ms. Kaori Yuda 1st year undergraduate student and Ms. Hiruni Madhusha Rupasingha 1st year doctoral student from Sri Lanka took the role of the MC. The participants enjoyed the conversation each other and did Origami too. UoA Wind Ensemble members were invited to play some music for the event. That was a wonderful performance. For the closing remark, Mr. Saito who is a Staff for Promotion of University Education led the people to do "Ipponjime" which is a traditional clapping ritual to honor the close of a formal event. The second term Japanese seminar has started on October 11, 2016. The seminar participants are mainly UoA international students, faculty and their family members. The purpose of this seminar is to improve Japanese communication skills and to build a connection to the community through interaction with Japanese students and local people in Aizu. 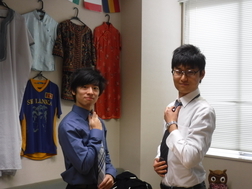 In this seminar, there are five courses from beginner to business Japanese. "Experience of Japanese Traditional Culture"
UoA students, mostly international students joined "Japanese Cultural Seminar 2016 (summer session)" held on September 15, 2016. The purpose of this seminar is to encourage students to get familiar with Aizu and Japanese history and culture through interaction with local residens and experience activities, and to understand the culture and history profoundly. 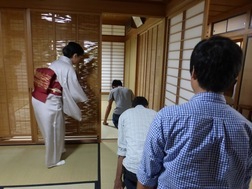 At this time, the students experienced one of the most typical Japanese traditional cultures, tea ceremony. The tea ceremony took place in Aizu Wakamatsu City, and the tea master and her assistants provided the students with kind instructions individually. The students keenly listened to explanations about the manner and the movement, and asked a lot of questions after the explanations. Further, the students seemed to love the tea and snacks, so some of them requested another bowl of tea and asked a name of the store where they could buy the snacks. Since the students were able to be exposed to the culture directly through the tea ceremony, which helped them understand it profoundly, this seminar was really productive for them. The OSIP will proactively work on and open such activities in the future. "Japanese Culture Seminar" was held on August 7, and 19 UoA students (17 international students and 2 Japanese students) joined the seminar. The goal of the seminar is that international students in Fukushima can learn history and culture of Fukushima through its various cultural properties and interaction with Japanese students and local people. 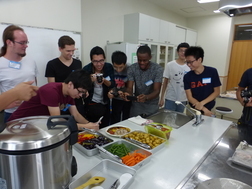 Firstly, the students visited "Culture Center Tokiwa" in Tamura City and cooked "Tamura Colorful Curry" with the local people. 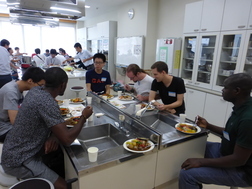 The curry, which has a lot of local colorful ingredients as its name indicates, is an original curry produced from the city, and the students enjoyed it very much. Afterward, the students joined a summer festival and got fully interested in the events they watched for the first time. In particular, the students were very facinated with "Beatle Wrestling" since it is Japanese traditional game and become very unique for them. 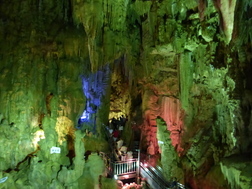 Lastly, the students visited Abukuma Cave which is around 80 million years old, and the cave caught their attention a lot because its color was mysteriously changed with light. Through these activities, the students were able to learn culture and history of Fukushima deeply, so the seminar was really productive for them.
" 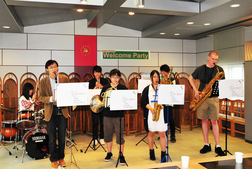 Welcome Party" for new faculty and staff members and international/Japanese students who joined the University in April 2016 was held at Keyaki restaurant(2F the Student Hall) on Wednesday, May 25th, 2016. The event is jointly organized by OSIP and SAISUA in spring and fall every year. There was a total of 64 participants including President Oka, Vice President Tei, faculty and staff members, and international/Japanese students. We were given welcome messages from President Oka and Associate Professor Julian Villegas who became a President of the SAISUA in 2016. Continuously new comers introduced themselves. New international students are from China, Taiwan, Nepal, Sri Lanka, Cameroon, US and Germany. Mr. Hayato Watanabe, 2nd year undergraduate student and Mr. Jengyung Chen, 1st year graduate student from Taiwan took the role of the MC. The participants mingled and enjoyed the conversation. Mr. Saito who is a Staff for Promotion of University Education led the people to do "Ipponjime" which is a traditional clapping ritual to honor the close of a formal event. 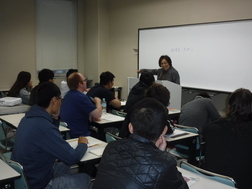 The first term Japanese seminar has begun on May 10th. The participants of Japanese seminar is mainly professors, international students of the University of Aizu, and their family members. The purpose of this seminar is to improve communication skills in Japanese and to live safely and independently in the community. In this seminar, there are 5 courses from beginner to business Japanese. We will provide the second term Japanese seminar in October. 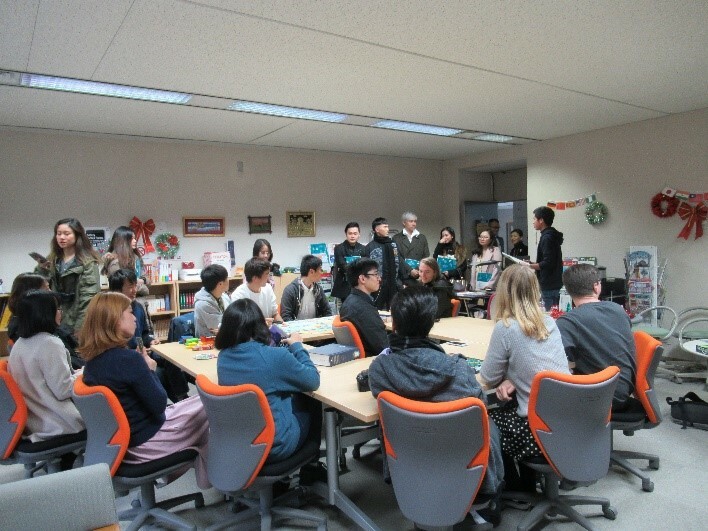 OSIP(Office for Strategy of International Programs) offered Japanese Seminars for international students, faculty members and their families at UoA. 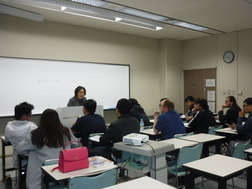 The second semester Japanese seminar was held from October 16th to December 4th. There were 3 courses available from beginners to intermediate students. 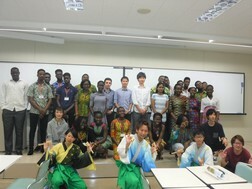 A total of 24 international students attended the Japanese Seminar. We presented certificates to participants who attended more than 80% of the course. 18 participants obtained certificates. The 16th International Talk was held by Center for Globalization and SAISUA on Wednesday December 2, 2015 at the Conference room, 1F Research Quadrangles. About 25 people including international and Japanese students, faculty and administrative staff members attended this event. The speakers at the 16th Talk were Mr. Tomoya Furukawa 4th year undergraduate student (Participant in 2015 Mid-term Overseas Study Program at the University of Porto), Mr. Tatsuya Hanyu 3rd year undergraduate student (Participant in 2015 Silicon Valley summer program), Mr. Akila Siriweera (2nd year master student, from Sri Lanka in 2014). The speakers gave the presentations about their research and study abroad experiences. After the presentation, participants had time for questions and answers and also enjoyed talking with each other.
" 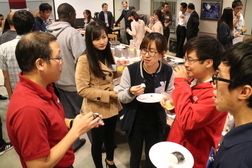 Welcome Party" for new faculty and staff members and international students who joined the University in October 2015 was held at Keyaki restaurant(2F the Student Hall) on Wednesday, November 18th, 2015. The event is jointly organized by the Center for globalization and SAISUA in spring and fall every year. There was a total of 45 participants including President Oka, Vice President Tei, faculty and staff members and international/Japanese students. Associate Professor Kim Rockell who is President of the SAISUA for 2015 took the role of the MC. We were given messages from President Oka and Vice President Tei, followed by self-introduction of new comers in October. New international students are from China, Taiwan, Vietnam, Sri Lanka, Russia, and US. The participants mingled and enjoyed the conversation. Mr. Takahashi who is a staff member led the people to do "Ipponjime" which is a traditional clapping for closing of a formal event. 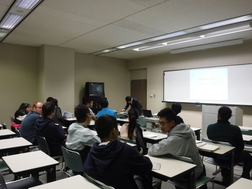 The Second Semester Japanese Seminar has started since October 16th. 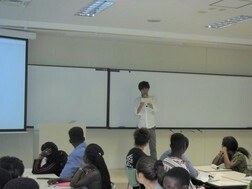 The participants learned Japanese language through self introduction in the first lesson. Our office will plan to provide 14 lessons on Tuesdays and Fridays for this Japanese Seminar. They will improve communication skills in Japanese and learn necessary Japanese language and culture to live in Japan. OSIP offers Japanese Seminars for international students, faculty members and their families at UoA. 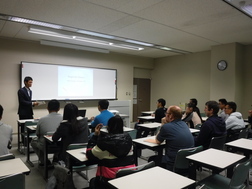 The first term Japanese Seminar was held from May 19th to July 3rd. We provided courses for beginners and intermediate students. We presented certificates to participants who attended more than 80% of the course. 6 participants obtained certificates. The first term Japanese Seminar has started since May 19th. The target of Japanese seminar is mainly Professors, international students of The University of Aizu, and their family members. The purpose of this seminar is to improve communication skills in Japanese and to live safely and independently in the community. We will provide Summer Culture Seminar (August), the second term Japanese Seminar (October) and Winter Culture Seminar (March). 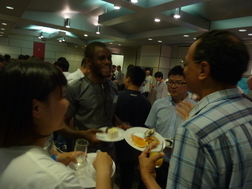 The "Welcome Hour", a welcome party for new faculty members, international students and administrative staff who joined the University in April 2015 was held at Keyaki restaurant( Student Hall 2F) on Wednesday, May 13, 2015 at 18:10. 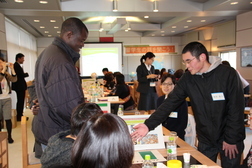 The event is jointly organized by OSIP/SAISUA in spring and in autumn every year. There was a total of 56 participants including President Oka, vice president Tei, faculty/staff members and international/Japanese students. Associate Professor Kim Rockell who is President of the SAISUA for 2015 took the role of the MC. We were given messages from President Oka and followed by self introduction of new comers in April. 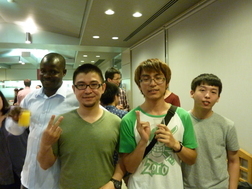 The short term international student from the US also attended the party. The Japanese students conversed with the international students in English. Faculty staff were enjoying conversation as well. The participants mingled and enjoyed each other's conversation. Mr. Takahashi who is a staff member led the people to do "Ipponjime" which is a traditional clapping ritual to honor the close of a formal event. The party went very well. 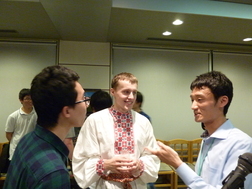 A" Welcome Hour" , a welcome party for new faculty members, international students and administrative staff who joined the University in October 2014 was held at Keyaki restaurant(the Student Hall) on Wednesday, November 12, 2014 at 18:10. The event is jointly organized by CSIP/SAISUA in spring and autumn every year. There was a total of 38 participants including President Oka, vice president Tei, faculty/staff members and international/Japanese students. Associate Professor Kim Rockell who is President of the SAISUA for 2014 took the role of the MC. We were given messages from President Oka and vice president Tei, followed by self introduction of new comers in October. New international students are from China, Taiwan, Vietnam, the US, Sri Lanka and Belarus. The participants mingled and enjoyed each other's conversation. The party was warming up and went very well. 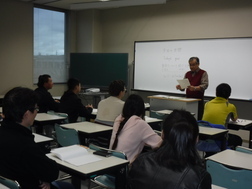 The second term Japanese Seminar has started since October 21st. 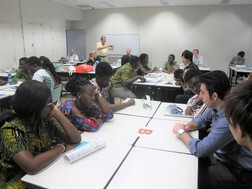 The participants were leaning Japanese through self- introduction in the first lesson. We are planning to provide 14 lessons in this session. They will improve communication skills in Japanese and learn necessary Japanese language to live in Japan. We will provide Winter Culture Seminar in March. 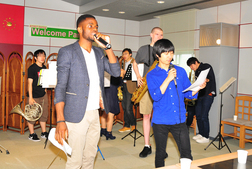 The study abroad fairs for mid-term period and short-term period were held in May. University of Aizu promotes and supports international education by offering various programs for study abroad to the students. We hope many students challenge those oversea programs. Approximately 20 students joined the mid-term period study abroad fair on May 16. At first, Professor Rozycki, Director of Center for Language Research and Studies, gave a short opening speech. Then CSIP office provided the information on overseas study programs. 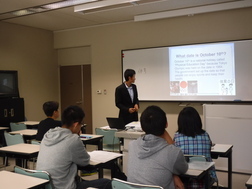 After that, Mr. Taku Nagasaka made a presentation about his student life at RHIT. In Q&A, Mr. Ryohei Suda and Ms. Yurika Hashimoto joined with Mr. Nagasaka and talked about their experiences in overseas. The short-term study abroad fair was held on May 23, which was a part of freshman English class, and approximately 244 students including non-freshman. Professor Shigaku Tei, Vice president gave an opening speech. 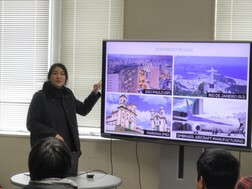 CSIP office and Professor Kaneko provided the information of overseas program and "Global Experience Gateway" class. After that, Mr. Kotaro Maruyama, Ms. Misato Morino, Mr. Masashi Yoshida, Mr. Tsubasa Watanabe, and Mr. Asaichiro Kazawa made a presentation about their experience at RHIT. Mr. Keisuke Tamoi and Mr. Satoshi Hotta gave a presentation about DNA program in China and Chinese culture. All the presentation were very unique in their own way, the audience　enjoyed them. At the end, Professor Brine and Professor Kawaguchi summarized the fair. It is very important to learn from the real experience given by senior students. Number of students who visit CSIP office to ask about these programs have increased, which shows, we think, that motivation is getting higher for international education. All the CSIP staffs have experiences of in studying overseas, so let us know if you have any questions. We are looking forward to seeing you at CSIP office. The first term Japanese Seminar has started since May 21th. The target of Japanese seminar is mainly Professors, international students of The University of Aizu, and their family members. The purpose of this seminar is to improve communication skills in Japanese and to live safely and independently in the community. We will provide Summer Culture Seminar (August), the second term Japanese Seminar (October) and Winter Culture Seminar (March). A "Welcome Hour" a welcome party for new faculty members, international students and administrative staff who joined the University in April 2014 was held at Keyaki restaurant (the Student Hall) on Wednesday, May 14, 2014 at 18:10. The event is jointly organized by CSIP/SAISUA in spring and in autumn every year. 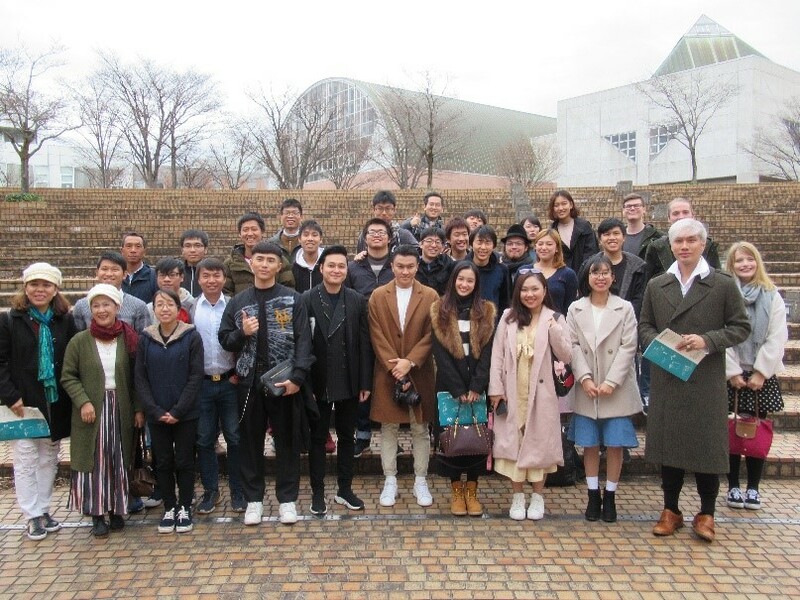 There was a total of 39 participants including President R.Oka, CSIP Director J. Iwase, faculty /staff members and international/Japanese students. Professor Kim Rockell who is President of the SAISUA. for 2014 took the role of the MC and the party went ahead in a friendly atmosphere. The party started with a welcome address by President Oka and Director Iwase. We were given a message of working as a team for internationalization, followed by self introduction of new comers in April. The short term international students from France and Slovenia attended the party. 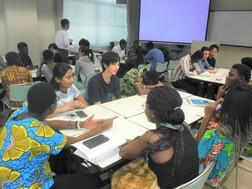 The Japanese students conversed with the international students in English. Faculty staff were enjoying conversation as well. We had an enjoyable time at the party. Mr. Fujii who is a staff member led the people to do "Sanbonjime" which is a traditional clapping ritual to honor the close of a formal event. It made us warms up. The party went very well. A "Welcome Hour," a welcome party for new faculty members, international students and administrative staff who joined the University in October 2013 was held at Keyaki restaurant (the Student Hall) on Wednesday, Nov. 20, 2013 at 18:10. The event is jointly organized by CSIP/SAISUA in spring and in autumn every year. There was a total of about 40 participants including CSIP Director J. Iwase, faculty/staff members and international/Japanese students. The party started with a welcome address by Director Iwase, followed by self-introduction of new comers.In October, 15 students enrolled in the Graduate School from Vietnam, China and Taiwan. An exchange student from the Rose-Hulman Institute of Technology also attended the party. She enjoyed the talk with other international and Japanese students. 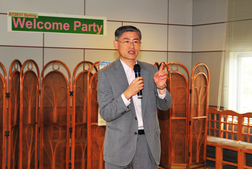 Professor Heo who is President of the SAISUA for 2013 took a role of the MC and a happy one-hour passed all too soon. A "Welcome Hour," a welcome party for new faculty members, international students and administrative staff who joined the University in April 2013, was held at Keyaki restaurant (the Student Hall) on Thursday, May 9, 2013 at 18:10. The event is jointly organized by CSIP/SAISUA in spring and in autumn every year. There was a total of 44 participants including President Tsunoyama, CSIP Director Iwase, faculty/staff members and international/Japanese students. SAISUA President for 2013 is Dr. Y. Heo who is a young professor belonging to the Center for Language Research. She acted as a MC of the party. As in the past, the party started with a welcome address by President Tsunoyama. Then, self-introduction by new comers followed. In this term, there are very first students from Kyrgyzstan and Germany to enroll in the Master's Program. In the middle of the party, a chorus group that was newly formed last year by the Japanese students sung two songs to welcome the new comers. The Fifteenth International Talk was jointly held by SAISIA and CSIP on Tuesday, February 19, 2013 at the Research Quadrangles. The speaker at the 15th talk, titled "Russia: the Land of Opportunity, Contrast and Free Wi-Fi", was Mr. Arkady Zgonnikov, a 2nd-year student of the Ph.D program of the University. About 23 people including international and Japanese students, faculty and administrative staff members of the University attended in the occasion of the talk about Russia that is one of the booming countries in the current world economy. He touched upon the long history of his country compactly and in a comprehensible way. Then he explained about the current Russian economy especially in the fields of science and IT. He also referred that Russia is "between the West and the East". In answering questions after the talk, he mentioned that he was a bit surprised to know Russia and Japan are still under negotiation of the Treaty of Peace. A "Welcome Hour," a welcome party for new faculty members, international students and administrative staff who joined the University in October 2012 was held at Keyaki restaurant (the Student Hall) on Friday, Nov. 2, 2012 at 18:10. 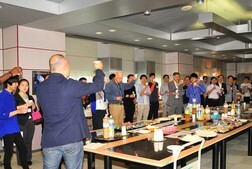 The event is jointly organized by CSIP/SAISUA in spring and in autumn every year. There was a total of 30 participants including President Tsunoyama, faculty/staff members and international/Japanese students. The party started with a welcome address by President Tsunoyama. In October, new 13 graduate students enrolled in the Graduate School. Among them, 9 students are international students from Vietnam, Russia, China and Taiwan. A visiting student from Finland also attended the party. She is originally from Rwanda and is now a Ph.D student in a Finnish university. She enjoyed the talk with other international and Japanese students. Professor Ginsburg who is President of the SAISUA for 2012 took a role of the MC and one-hour party passed all too soon. 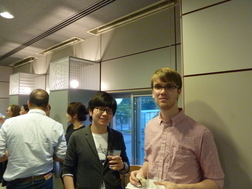 A "Welcome Hour," a welcome party for new faculty members, international students and administrative staff who joined the University in spring 2012 was held at Keyaki restaurant (the Student Hall) on Thursday, May 10, 2012 at 18:10. The event is jointly organized by CSIP/SAISUA in spring and in autumn every year. There was a total of 43 participants including President Tsunoyama and Prof. Rozycki, 2011 Chair of SAISUA. The party started with a welcome address by President Tsunoyama. This year our University received a very first student from Laos. He is a research student and will enter the Master's Program in October. The attendees were very surprised to hear his self-introduction in fluent Japanese. Twelve Japanese students also joined the party this time from a student circle "Win-win Club". Professor Rozycki took a role of the MC and many participants left the venue with strong reluctance after one hour. 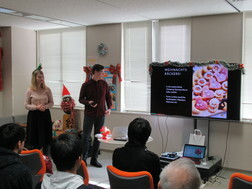 The Fourteenth International Talk was jointly held by SAISIA and CSIP on Tuesday, December 13, 2011 at the Research Quadrangles. The speaker at the 14th talk, titled "One way ticket from Japan to Japan", was Mr. Nobuhiro Aita, a 3rd-year student of the University. Mr. Aita challenged an around-the-world trip and returned to Japan in September, 2011, after successfully finishing his trip through 45 countries for almost two years. His vagabond-style trip started from Shanghai. In India, his bicycle was stolen, and he suffered from high-altitude illness while climbing up Mt. Everest in Nepal. He had lots of great encounters and valuable experiences everywhere he visited. His journey continued from Asia through Europe and Middle East to Africa. After traveling down to the Cape of Good Hope, he flew to South America and headed to North America. He drove across the U.S.A. from coast to coast with friends he met in the States, and flew back to Japan from San Francisco. His adventure finally came to an end after one year and ten months. During the trip, with the news of the Great East Japan Earthquake and tsunami disaster on March 11, he considered coming back to Japan, but decided to continue his trip as he was able to confirm the safety of his family and house in Miyagi Prefecture, one of the disaster-struck areas. More than 30 people who attended the talk, including students, faculty and administrative staff members of the University, very much enjoyed his talk on many fascinating experiences. Mr. Aita was asked a number of questions during and even after the talk. 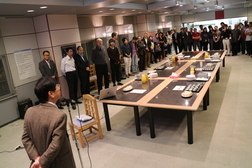 CSIP and SAISUA jointly organized a "Welcome Hour," a welcome party for new faculty members, international students and administrative staff who joined the University in autumn 2011. 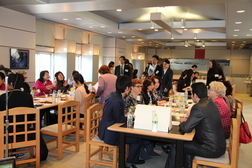 The event was held at Keyaki restaurant (the Student Hall) on Friday, Nov. 4, 2011 at 18:00. There were more than 30 participants including President Tsunoyama and his wife, faculty and staff members, and students. Prof. A. Ben, Treasurer of the SAISUA took a role of the MC and the party started with a welcome address by President Tsunoyama. 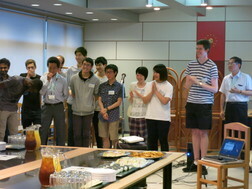 This time 14 international and Japanese students from a student circle "Win-win Club" attended the party. This circle aims to have an intercultural communication between international students and Japanese students. After a scheduled one hour, especially international and Japanese students were reluctant to leave the venue as though there seemed no end to conversation topics. CSIP and SAISUA jointly organized a "Welcome Hour," a welcome party for new faculty members, international students and administrative staff who joined the University in spring 2011. 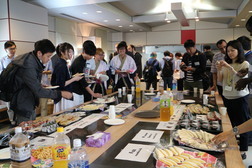 The event was held at Keyaki restaurant (the Student Hall) on Thursday, Jun. 16, 2011 at 18:00. There was a total of 40 participants including President Tsunoyama and his wife, and the CSIP Director Iwase. A welcome hour in spring had to be postponed to June along with resuming the university in May due to the East Japan Earthquake on March 11, 2011. At the beginning of the welcome hour, there was a moment of silent prayer for the victims of the East Japan Earthquake on March 11, 2011. Then, President Tsunoyama gave an address of welcome. Responding to a call by the CSIP, about 10 Japanese students joined the party this time. Six students from Vietnam and Sri Lanka who were transferred to the 3rd year of the Undergraduate School of the UoA this spring for the first time, also attended it and enjoyed talking. Professor Rozycki, President of SAISUA, took a role of the MC and the one-hour welcome hour ended too soon. SAISUA and CSIP jointly organized Thirteenth International Talk on Feb. 7 (Mon), 2011 from 18:10 to 20:00 at the Research Quadrangles. The speaker of the talk was Dr. Marcin Paprzycki from the Polish Academy of Science with a title "Poland: Everything that you ever wanted to know, but were afraid to ask". He is a Visiting Researcher for 3 months at the University of Aizu from Poland. In his talk, he described about his country from various aspects such as history, culture and cuisine. He touched upon that there was almost no brain drain from Poland after the disintegration of the Soviet Union while Russia suffered from it very much. A total of 20 people including students, faculty and staff members on campus attended the talk. During the talk, a lot of questions were raised, and it resulted in extending the session for more than 30 minutes. The participants all enjoyed active exchange of opinions. CSIP and SAISUA jointly organized a "Welcome Hour," a welcome party for new faculty members, international students and administrative staff who joined the University in autumn 2010. 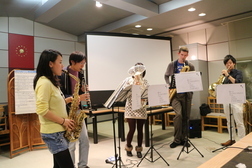 The event was held at Keyaki restaurant (on the 2nd floor of the Student Hall) on Thursday, Nov. 11, 2010 at 18:00. There was a total of 24 participants including President Tsunoyama. Professor Rozycki, President of SAISUA, took a role of MC and every new member said a few words of greeting. Among others, a first girl student from Russia and a very first student from Thailand entered our university in October. Participants including non-degree students from Taiwan enjoyed talking with each other in spite of very short "one hour". SAISUA and CSIP jointly organized Eleventh and Twelfth International Talks on June 7 (Mon) and on June 14 (Mon), 2010 respectively from 18:10 to 19:10 at the Research Quadrangles. The speaker of the 11th talk "Introducing Tanzania: the Land of Kilimanjaro and Zanzibar" was Ms. Saphina L. Mchome, a master student entered in October 2008, who is the first student from Tanzania to the University of Aizu. In her talk on her country which consists of 120 tribes, she described it from various aspects such as natural landscape, politics, industry, education and cuisine. There were more than 40 people including students, faculty and staff members on campus attended the talk, and the venue had to be changed to a larger lecture room. After one week from the 11th talk, the 12th talk was held at the lounge of the Research Quadrangles. Taking the opportunity of her visit to our university, we welcomed Dr. Marcia Johnson from Waikato University to deliver a talk about New Zealand and her university. She briefed about New Zealand and then explained in detail regarding Waikato University with plenty of reference materials. There were 28 participants including students, faculty and staff members. During each talk, many qustions were asked and answered. The participants all enjoyed active exchange of opinions. CSIP and SAISUA jointly organized a "Welcome Hour," a welcome party for new faculty members, international students and administrative staff who joined the University in April 2010. 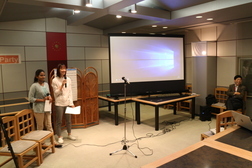 The event was held at Keyaki restaurant (on the 2nd floor of the Student Hall) on Monday, May 17, 2010 at 18:00. There was a total of 26 participants including President Tsunoyama and his wife, and Professor Rozycki, President of SAISUA, took a role of MC and every new member said a few words of greeting. Among others, a first student from Tunisia, two exchange students from Rose-Hulman Institute of Technology, USA, and five non-degree students from Taiwan attended the party. In spite of very short "one hour", participants enjoyed talking with each other. An event was held on Friday, April 9 from 7pm on campus with a purpose of introducing Portugal and the University of Porto. There were a total of 9 participants. Among those 9 were 2 students and 3 faculty members from our university and 4 participants from outside the university. The University of Porto is one of UoA's international partner universities and has mutual student exchanges. Assistant Professor Oi, who is a key faculty member for this relationship between the universities, organized this event. First, Mr. Takahashi (Senior, UoA), who studied at the University of Porto (Porto) on a UoA's Overseas Study Program made a speech. He made a speech about his life at Porto, achievements of his research and his future research which was inspired during his study at Porto. He also talked about the difficulties in understanding English spoken with Portuguese accent and how he was able to find more Japanese food than he thought. The participants deepen their understanding about Portugal. After that, Mr. Rui Rei from the University of Porto made a speech. Mr. Rei has studied at UoA since January, 2010 on JASSO Student Exchange Support Program. He talked about geography, culture of Portugal and the University of Porto showing many pictures. The pictures of rivers in Porto city and fireworks on San Joao festival were especially beautiful and received attention from participants. Finally, he also reported about his research during his stay in UoA. SAISUA and CSIP jointly organized Tenth International Talk on March 23 (Tue), 2010 from 15:00 to 16:30 at the Lounge of Research Quadrangles. There were a total of 22 participants with a breakdown of 9 students from our university and also from Rose-Hulman Institute of Technology (USA) and 13 from university faculty and staff members. The theme of the talk was about "the University of Rome Sapienza" by Professor Paolo G. Bottoni who are currently with us as visiting professor from the said university. There were two more speakers at the talk. They were Mr. Kazuyuki Nakamura (a master student) and Mr. Dmitry Vazhenin (a Ph.D student) who visited the University of Rome Sapienza for several months under JASSO Student Exchange Support Program. The University of Rome Sapienza was founded in 1303. Prof. Bottoni introduced his university referring to its long history, the changes of its naming and even the dark side during the Fascist Italy under Mussolini. Mr. Nakamura and Mr. Vazhenin spoke about their fruitful stay in Rome mainly touching upon their daily life in there. Many questions were raised during the talk and an active exchange session was held. SAISUA and CSIP jointly organized Ninth International Talk on January 21 (Thurs), 2010 from 18:00 to 19:30 at the Lounge of Research Quadrangles. There were a total of 20 participants with a breakdown of 7 university students and 13 from university faculty and staff members. The speaker was Ms. Ruth Patricia Cortez Recinos, a master student, with a title of "El Salvador: Tom Thumb of the Americas". She is a first student from El Salvador to the University of Aizu who entered in October 2009. Wearing a traditional costume, she introduced her country referring to the diversity of natural landscape, friendly people, food and tradition. The participants hanged on her talk enthusiastically which was rather unfamilier to the attendees. Many qustions were raised during the talk and an active exchange session was held. The University of Aizu International Student Organization (UAISO) was newly founded sponsored by SAISUA and CSIP. As their first event, UAISO organized "International Coffee Hour" at the South Lounge, the 2nd floor of the Research Quadrangles on Tuesday, December 15 from 11:00 a.m. to 12:00 p.m. A total of 18 students participated from the following countries: China (6), Sri Lanka (3), Taiwan (2), Russia (2), Bulgaria (1), Korea (1), Colombia (1), Vietnam (1) and El Salvador (1). At this meeting, the participants discussed about the organization, and the organizer encouraged students to give ideas for upcoming events. The main objectives of the organization were explained: 1) promotion of cooperation among international students 2) encouragement of cultural exchange with Aizu communities and 3) promotion of the University of Aizu. Please expect and cooperate with their future activities and events. CSIP organized Study Abroad Fair on Wednesday, December 2nd, aiming also to promote the recruitment of students for "Short-term" Overseas Study Program for AY2009, and 17 undergraduate students participated in the fair. Professor T. Orr (Director of Center for Language Research) gave a speech about significance of studying at leading Engineering universities in USA. Mr. Kawaguchi (Associate Instructor of CSIP) also explained the outline of the program and gave a speech about how to prepare for studying abroad. After that, Mr. Naoya Horiguchi (Senior) and Ms. Dongxue Ma (Senior), who studied at Rose-Hulman Institute of Technology for 3 weeks on the same program of AY 2008, gave speeches in English about their experiences during this program. Showing pictures, they talked about their impression of classes they audited, activities in their free time and a schedule of a day, etc. They also showed a video of a class and very thick textbooks they bought. It was a valuable opportunity for the participants to know some aspects of a university in USA. CSIP and SAISUA jointly organized a "Welcome Hour," a welcome party for new faculty members, international students and administrative staff who joined the University in autumn 2009. 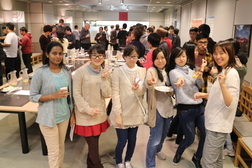 The event was held at Keyaki restaurant (on the 2nd floor of the Student Hall) on Wednesday,Nov. 11, 2009 at 18:00. There was a total of 44 participants including President Tsunoyama and Regent Iwase. Professor Rozycki, President of SAISUA, took a role of MC and every new member said a few words of greeting. Among others, a total of 17 new international students including non-degree students attended the party and enjoyed talking with each other in spite of very short "one hour". The Center for Strategy of International Programs and the Center for Language Research jointly held an international exchange and study event for first-year students on Wednesday, May 27. 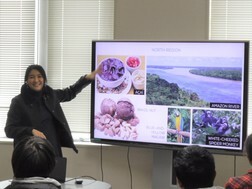 At the event titled "Life of an International Science and Engineering Student," Assistant Instructor Kawaguchi made a presentation about international exchange opportunities in the University. Senior students who had participated in a short-term study program at Rose-Hulman Institute of Technology (RHIT), the U.S.A., one of the University's international partners, and three exchange students from RHIT were also invited to the event to talk about their college lives in the U.S.A. Their speeches included their lives in the dormitory, after-school activities, facilities in downtown (movie theaters, restaurants, etc. ), and how they spent their free time. It was a great opportunity for the participants to get an idea of the life of students studying the same field in other countries. This sort of event will be held continuously for different grades. SAISUA and CSIP jointly organized Eighth International Talk on May 19 (Tue), 2009 from 18:00 to 19:30 at the Lounge of Research Quadrangles. There were total 21 participants with a breakdown of 8 university students and 13 from university faculty and staff members. 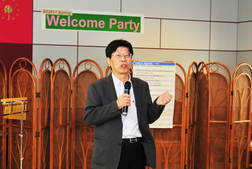 The speaker was Mr. Chang Won Du, Ph.D student, with a title of "Dynamic Korea! Welcome to Korea!." He is a first student from Korea to the University of Aizu, and now there are three more students from Korea studying at UoA. He introduced his country including the history, education, language, Korean cuisine culture and so on. 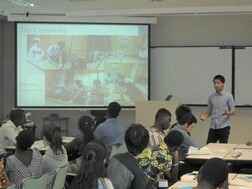 The participants had much interest about Korea. Many qustions including his hometown Busan City, a fabulous honeymoon mecca Jeju Island and the conflict between South and North Korea, were raised during the talk and an active exchange session was held. CSIP and SAISUA jointly organized a "Welcome Hour," a welcome party for new faculty members, international students and administrative staff who joined the University in April 2009. 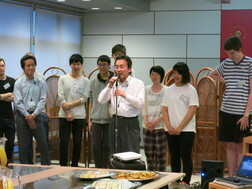 The event was held at Keyaki restaurant (on the 2nd floor of the Student Hall) on Wednesday, May 13, 2009 at 18:00. There was a total of 42 participants including President Tsunoyama, and Professor Rozycki, President of SAISUA, took a role of MC and every new member said a few words of greeting. There was a DVD show broadcasted at the local TV in which Mr. Yuxiang Mao, Ph.D student from China was introduced as a grand master of Shorinji martial arts. 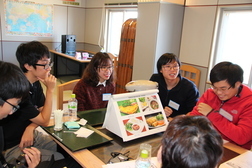 In spite of very short "one hour," participants enjoyed talking with each other while having sandwiches, onigiri (rice balls) and soft drinks. SAISUA and CSIP jointly organized Seventh International Talk on December 18 (Thurs), 2008 from 18:00 to 19:30 at the Lounge of Research Quadrangles. There were total 14 participants with a breakdown of 7 university students and 7 from university faculty and staff members. The speaker was Mr. Norbert Gyorbiro, Ph.D student, with a title of "Hungary, where Martians come from." He is a first student from Hungary to the University of Aizu. He introduced his country including the history, language, economy, education, culture and so on. At the last part of the talk, he gave some quizzes about famous scientists of Hungary and gave Hungarian coins to the winners as a prize. One of the famous scientists of Hungary would be Dr. John Von Neumann who is called as one of the fathers in computer and wrote a well-known book titled "Theory of Games and Economic Behavior." Other Hungarian scientists are Dr. Rubik Erno who invented Rubik's Cube, Dr. Peter Frankl who is a mathematician and also a street performer, etc. 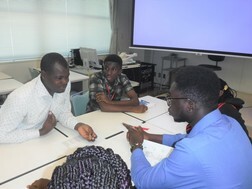 During the talk, many qustions were raised and an active exchange session was held. CSIP and SAISUA jointly organized a "Happy Hour," a welcome party for new faculty members, international students and administrative staff who joined the University in October 2008. 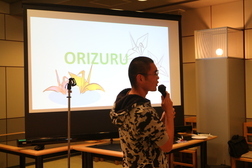 The event was held at Keyaki restaurant (on the 2nd floor of the Student Hall) on Thursday, Oct. 23, 2008 at 18:00. There was a total of 40 participants including President Tsunoyama. Assistant Professor Pham, President of SAISUA, took a role of MC and every new member said a few words of greeting. In spite of very short "one hour," participants enjoyed talking with each other while having soft drinks and snacks. SAISUA and CSIP jointly organized Sixth the "International Talk" on July 17 (Thur), 2008 from 18:00 to 19:30 at the Lounge of Research Quadrangle. There were total 15 participants with a breakdown of 9 university students and 6 from university faculty and staff members. There were two topics for the 6th talk. The first speaker was Mr. Rasika Ranaweera, student of the Master's program, titled "Sri Lanka, The Emerald Island". He entered the University of Aizu this April from Sri Lanka. He introduced his country including its history, language, economy, education, culture among other things. He also introduced a famous Sri Lankan song and served Ceylon tea with cashew nuts to the attendees, that created a friendly and relaxed atmosphere for the talk. 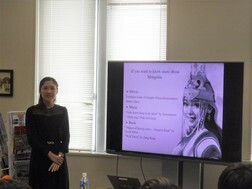 The second topic was a study report by Ms. Yuka Sato, student of the Master's program. She went to the University of South Carolina (USC) for three months from January 5 to March 31, 2008 under a short-term study abroad program held by the University. She reported on the classes she attended and her research theme that started at USC. After school hours, she joined the "Nihon Club" and enjoyed private time with friends. After each talk, an active Q&A session was held with many questions. SAISUA and CSIP jointly organized Fifth International Talk on June 5 (Thur), 2008 from 18:00 to 20:00 at the Lecture Room 8 of Research Quadrangle. There were total 31 participants with a breakdown of 22 university students and 9 from university faculty and staff members. First speaker was Mr. Shin Hasegawa, doctoral student. He went to Stanford University in USA for three months from January 4 to March 31, 2008 under a short-term study program in abroad by the university. He stayed at a motel for 2 months and at an apartment for 1 month and commuted by bicycle. During his stay there, he had a chance to attend an international conference in Anaheim, CA, which inspired his research activities very much. Secondly two students who attended the study program at Rose-Hulman Institute of Technology (RHIT), reported their stay for 18 days in March, 2008. 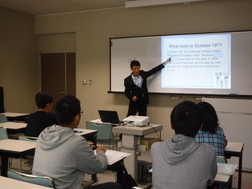 Mr. Junichi Fujinuma, sophomore student, explained in detail about the time schedule of RHIT and the courses he took. Mr. Fumio Nakajima, senior student, briefly reported about the courses he took and some private life there avoiding a duplication. They were very impressed by the students of RHIT that study hard and play eagerly. After each talk, an active Q&A session was held with many questions. They gave some valuable advices how to fill out an application of the program. Their talks were very rewarding and helpful for the students who are interested in a short-term study program in abroad. At last, Visiting Researcher Prof. Abdel Ejnioui had a brief introduction of his University of South Florida. 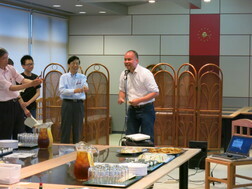 CSIP and SAISUA jointly organized a "Happy Hour," a welcome party for new faculty members, international students and administrative staff who joined the University in April 2008. 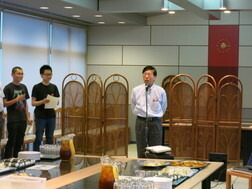 The event was held at Keyaki restaurant (on the 2nd floor of the Student Hall) on Wednesday, May 14, 2008 at 18:00. There was a total of 48 participants including Director Iwase of CSIP, and Assistant Professor Pham, President of SAISUA, took a role of MC and every new member said a few words of greeting. In spite of very short "one hour," participants enjoyed talking with each other while having soft drinks and snacks. SAISUA and CSIP jointly organized a "Happy Hour," a welcome party for new faculty members, international students and administrative staff who joined the University this year. The event was held at Keyaki (on the 2nd floor of the Student Hall) on Thursday, October 18, 2007, at 6:00 p.m. 42 participants including President Tsunoyama and his wife enjoyed talking with each other while having refreshments and light meals. Assistant Professor DeHart, President of SAISUA, made a speech explaining the origin and meaning of the word, "welcome." Following Professor DeHart's speech, President Tsunoyama, new faculty members and international students gave brief speeches. The Happy Hour quickly passed with lively and friendly conversations among the particpants. CSIP offers Japanese Class for international students, international faculty members and their family at UoA. The classes are held at rooms on the 2nd floor of Research Quadrangle. Instructors from Aizu Wakamatsu International Association teach 4 different levels of courses, and each class includes 10 lessons. All the class for Academic Year 2007, the first term (April 2007 - July 2007) and the second term (October 2007 - January 2008), is now completed. SAISUA and CSIP jointly organized Third International Talk on December 13 (Wed) from 16:30 at the Lounge of Research Quadrangle. There were total 14 participants with a breakdown of 5 university students, 7 from university faculty and staff and 2 from outside the university. Prof. Pham explained very intelligibly about the history, the people, the culture and other aspects of his country Vietnam. Many questions were raised during his talk. At the last of his talk, he gave a quiz relating to Vietnam to the participants and a master student won the prize. 1) "International Talk is such a great opportunity to talk with people from overseas." 2) "This is my third participation in International Talk. I have learned about Colombia, China and Vietnam so far. I am looking forward to joining the next one and learning about other countries." Two interpreters of UoA (Ms. Humi Hasunuma and Ms. Sanae Hirata) participated in Japan Interpreters Association's intermediate simultaneous interpretation seminar held at Tsuda Hall in Shinjyuku, Tokyo, from August 17 to August 20. *CSIP continues to provide the University staff with training opportunities like this in the coming months. 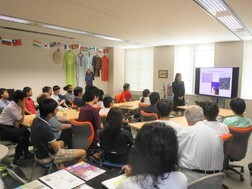 SAISUA and CSIP jointly organized Second International Talk on August 3( Thur.) from 17:00 at the Lounge of Research Quadrangles. There were total 11 participants with a breakdown of 7 university students and 4 from faculty and staff members. Mr. Xin Zhu(from China) talked a lot including his background , research theme and his stay in Aizu. Since he has been staying in Aizu more than 3 years, he is very much accustomed to the life in Aizu. He gave some useful recommendations to the junior students. After his talk, an active Q&A session was held with that almost every participant asked a question to him. One of the questions was a serious one regarding the World War Ⅱ, but he honestly and sincerely answered the question. ＊Next International Talk is scheduled in October ( dates to be arranged). 3rd year student:"I enjoyed the active Q&A session with a small group. This was a really good opportunity to communicate with a Chinese although we had a serious conflict in the past history." 2nd year student:"This was my first experience to participate in the Talk. I had some difficulties to understand his talk in English due to my poor ability of the language. I regret not to have understood his talk in more detail. But this was a useful experience to know that how he chose this university and how his stay was in Aizu, etc." SAISUA and CSIP jointly organized First International Talk on June 28 (Wed) from 18:00 at the Lounge of Research Quadrangles. 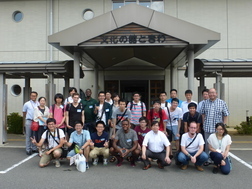 There were total 23 participants with a breakdown of 14 university students, 2 from Aizu-Wakamatsu International Association and 7 from university faculty and staff members. Mr. Julian Villegas ( master student ) introduced his country Colombia from various view points and referred to the drug issue too. After his talk, active Q&A session was held and the discussion went further. "The talk on Colombia was quiet new to me and very interesting. I enjoyed the talk very much and felt the difference of culture although the time was limited." JAFSA(Japan Network For International Education ) staff training program in Nagoya. Ms.Yuriko Nagashima (foreign personnel advisor of UoA and also a member of CSIP) and Ms. Kaori Sato (foreign personnel advisor of UoA ) participated in "JAFSA staff training program Ⅰ"which was held at Nanzan University training center in Nagoya from June 1 to June 3, 2006. This program is for the staffs at the universities and institutes in Japan who are in charge of international relations like assisting overseas students enter the universities in Japan. "There were twenty-eight participants from private, public and national universities all over the nation. It turned out that we all have the common problems to tackle in our job duties, no matter in which institution we are working. It was a great experience to network with those people to share the goals and concerns, and exchange notes to learn from their best practices." CSIP plans to continue to provide the University staff with training opportunities like this in the coming months. About 20 participants signed up for Intensive Japanese Classes by Saito-sensei. We also had another series of begineers-level courses held each Tuesday by Aizu local teachers. 22 participants of international faculty, students and their family took part. After joining Tajima Kenko Picnic Walk, we took a bus to a famous local offering, To-No-Hetsuri site. International Ski Fun Event was held on a sunny day of 11th, March, Saturday in Inawashiro Skiing Ground. SAISUA took initiatives in gathering local support will. 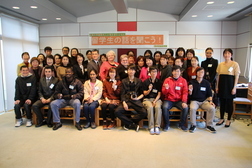 Over 50 participants were international faculty and international students,with their family members. We are grateful to those who have contributed to making happen this one-day outing.